It consists of the two ears plus parts of the central nervous system, a marvelously effective neural machinery. Most of these activities are subconscious, but the final result is sent upwards to the cerebral cortex, thus making the individual aware of the details of ongoing events. Babies are not good at hearing. But the newborn’s hearing system is, over the years and step by step, learning to extract information from the bewilderingly complex patterns of acoustic events impinging on the ears. Hence, the auditory system has to undergo proper development during childhood. It is similar to walking or writing. Newborns can only make very crude movements, but after a while they manage to stand up, while holding onto a wall or a piece of furniture, then they walk slowly and insecure. But the skills improve under proper training by a diversity of different activities. – Many countries have screening programs to detect children that have been born with damaged ears. This laudable approach enables the use of cochlear implants plus special training. In this way the auditory system can develop over the years, leading to a more or less good quality of hearing. Too much sound ruins the ear. Over-stimulation basically comes in two forms, and both lead to crippling or death of hearing cells (=hair cells). – long-term exposure to high noise levels. Duration typically many hours, months, years, or even decades. – strong impulses. Isolated events lasting up to about 1 s. Examples are shots, bangs and explosions, but also short bursts like a siren starting to wail. Based on decades of experience, it can be stated, that powerful impulses cause much more damage than continuous noise. 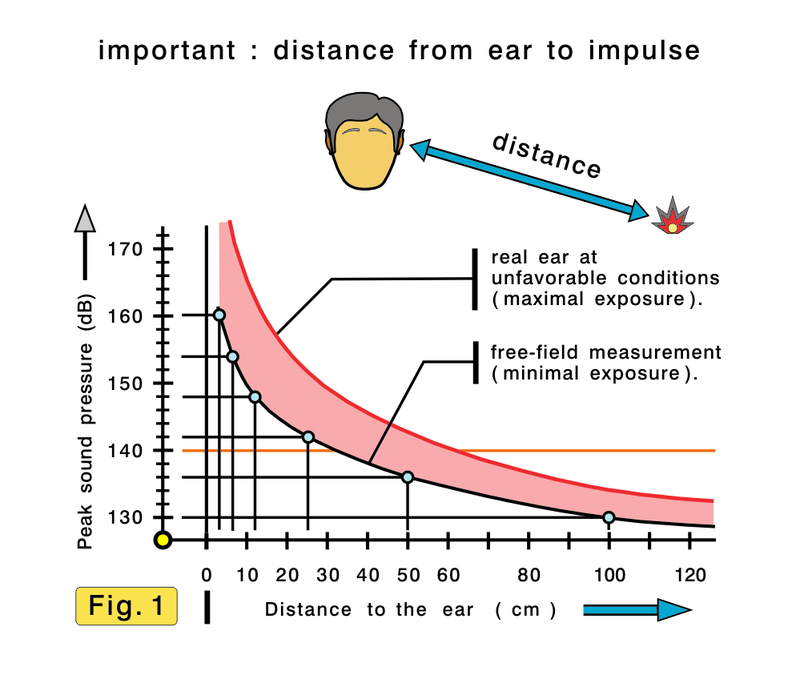 Most critical, for auditory impairment, is the distance between the impulse and ear(s) involved (Fig.1). The closer the impulse is to the ear, the higher is the peak sound pressure, as well as the overall energy that is impinging on the ear. An impulse drastically increases in harmfulness if the distance to the ear is reduced. Close to the ear the acoustic values are often much higher, because of reflexions from neighboring structures. The influence of this distance is much stronger than usually expected. A toy pistol, close to the ear, can affect the ear with a higher peak value than the shot of an anti-tank gun nearby! Since children are playing not only with Teddybears the European Union worked out a standard EN71 „Safety of toys–Part 1: Mechanical and physical properties“. It cannot be offered as PDF because the EU established sort of a national monopoly for selling such papers at high prices. 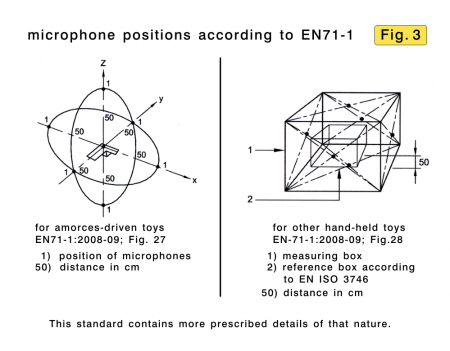 According to EN71, noise-emitting toys are grouped into different categories, such as mouth-actuated toys (whistles, trumpets and flutes), close-to-the-ear toys, rattles or squeeze toys, toys using percussion caps (amorces), i.e. toy pistols and related objects. Three types are shown in Fig. 2. The 1 Euro coin and the ballpoint pen are added to show the size. Measurement procedures are described, and limiting sound pressure values for most groups are listed. Measurements have to be made at a distance of 50 cm. Only for close-to-the-ear toys an ear coupler has to be used. Noise emanating from whistles, trumpets and flutes (mouth-actuated) are not being measured at all. Sound of whistles and horns is regularly most powerful between 2 and 4 kHz, where the susceptibility of the ear is highest. Needless to say, this noise would be much less dangerous, if these resonances would be shifted to lower frequencies, which is technically no problem at all. Noise from such toys is neither measured nor regulated by EN71. But ignoring reality is no effective protective measure. Toy pistols, and related objects (rifles based on the same technology), are designed to create a loud impulse, with the use of so-called amorces (Fig. 2, right). Amorces are a set of small ring-shaped plastic containers, filled with explosive material. The toy pistol is designed that, after pulling the trigger, one such container is hit by the bolt, resulting in a powerful impulse, lasting roughly 1 ms. Such very short acoustic impulses have properties that are important, but not widely known. Loudness detection in our auditory system is slow, so it takes about 100 ms to determine the real loudness. Because a powerful impulse of a toy pistol lasts about only 1 ms, its loudness-impression is systematically under-rated. Everyone thinks such a strong impulse is not that loud. However, analysis of accidents etc. reveal that those very short impulses are extremely harmful. – We are familiar with similar effects from other activities. If someone is hitting another person with the fist, he can cause damage, but using brass knuckles [UK knuckledusters] more severe injury is likely, and even more so if a dagger is used to stab someone. Of course, tools for the attack are made of metal, but another aspect is more prominent. In case of the punch, the force is applied to a relative large area of the opponent. Using the brass knuckles, this area is much smaller, and even more so if a dagger is used. Hence, if the force is applied to a very small area, application of little energy can cause massive damage. In the realm of hearing, area is not that relevant, but time. Sound is the rapid change of pressure. But otherwise its response to energy-application is similar: Acoustic energy, applied within 1 ms, is much more harmful, than if it is streaming into the ear over a much longer time-span. Hence, very short, strong acoustic impulses have so much power (energy/time) that they are extremely dangerous. Our documentation reveals that perpetrators and victims are nearly always boys, mostly at the age between 6 and 11 years. Typically one boy sees another he does not like, he approaches from behind and shoots with the toy pistol very close to the victim’s ear. Some perpetrator even tried to push the toy pistol’s barrel right into the outer meatus of the victim’s ear. Because it often happens within one or two seconds, victims practically have no chance of evading such an attack. Permanent damage, plus tinnitus (occasionally lasting for life), are the result of such an attack. Since this study the limit of EN71 for such toys has been lowered somewhat, but it still implicitly allows impulses that are illegal at the workplace. – There have been many studies on the effects of toys on children. For these amorces-driven toy pistols etc. the EN71 prescribes a detailed and cumbersome measurement procedure (Fig. 3, left). The toy weapon is in the middle, and 6 microphones are around it, all at a distance of 50 cm. For other hand-held toys the procedure is similar (Fig. 3, right). 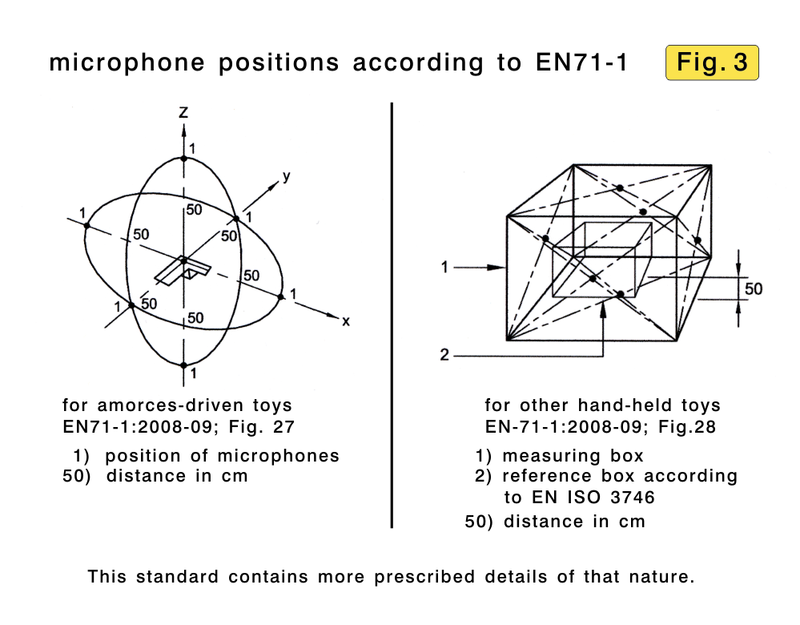 But while for toy pistols the microphones are 50 cm away from the center of the impulse, in other hand-held toys the micros have to be 50 cm away from a so-called reference box. Here we have to look at basics (Fig. 4). 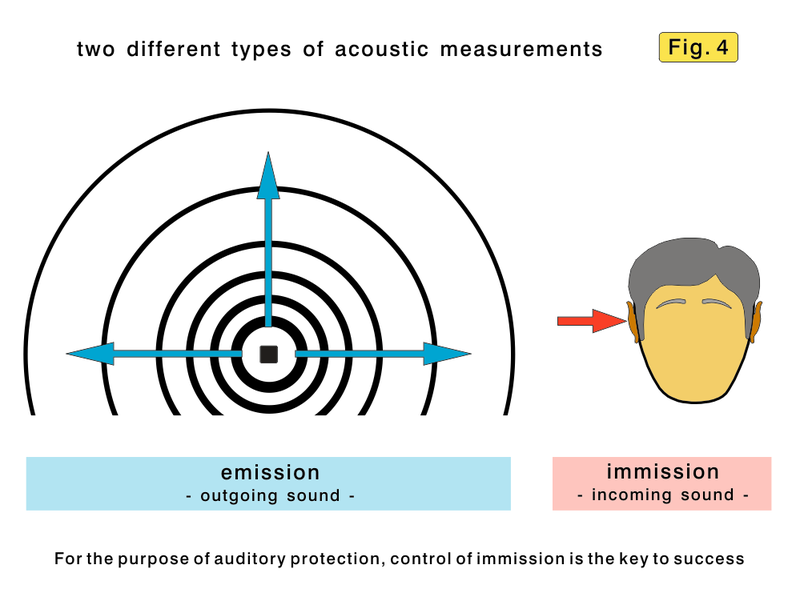 Measuring noise, it is essential to distinguish between “emission” (outgoing sound) and “immission” (incoming sound). Emission measurements are typically used for selling a technical product, such as a chain saw or a vacuum cleaner. An array of microphones, along with detailed procedures, is being used to determine the acoustic energy emitted. However, for preventing noise-induced hearing impairment, it is mandatory to restrict and measure immission. Surprisingly, the EU standard for toys, discussed here, is using emission for measuring noise from toys. This is simply the wrong type of measurement, because relevant is what arrives at the ear of children, and not what is found at the laboratory. Measuring emision is for manufacturers, while immission control is for auditory protection. Potentially harmful noise is also emanating from the workplace. The EU Directive 2003/10/EG, covering this topic, is remarkably clear and straightforward, and with just 7 printed pages it is refreshingly short. It demands that noise, reaching the ear, shall always stay below certain limits. (For peak-levels 140 dB(C)), for daily exposure 87dB(A)). Hence, at the workplace immission is being used, based on measurements at the ear. 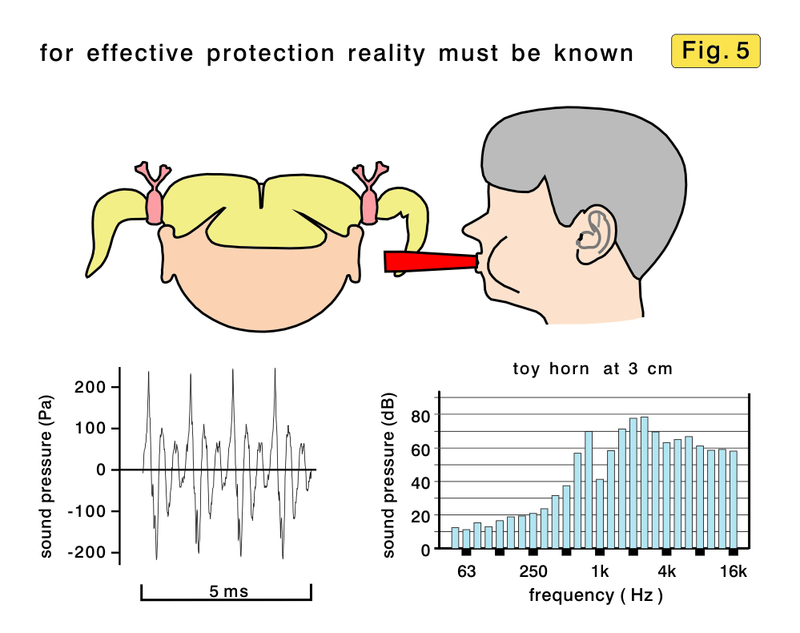 Why is the standard for toys using measurements unsuited for protecting the ear? As mentioned, the EN71 ignores mouth-actuated toys. These devices are so cheap – manufacturing may cost 1 cent, or less – they are often not sold individually, but included in bags containing various plastic toys or parts of toys. Typically no manufacturer is indicated, making legal action practically impossible. Signals of toy horns (Figs. 2 and 5) are dominated by resonance, and usually they emit most of their energy at frequencies above about 2 kHz, where the ear is most vulnerable to noise-induced damage. Mindful of this well-known fact, it is hard to understand why there are no efforts to suppress these extremely dangerous frequencies. These penny-products would not become more expensive, but less harmful. Many measurements of situations similar to the one shown in Fig. 5 have been performed with an impulse-dummy system, demonstrating how extremely harmful such toys are. The argument that such a use is not intended by the manufacturer appears ridiculous. Children are inquisitive, and impulsive, and they want to see what happens if they try something new. Experience shows that toys producing sound will at least occasionally be used close to the ear. It is also foreseeable that a child is putting a squeaking duckling directly at the ear of a toddler, squeezing hard, to please the younger sibling with „good sound“. Results of worst-case measurements (at the ear) are shocking. Noise from a loud squeaking duckling, that is commercially available, can ruin the ear. And with a really nasty toy horn it is possible to force the equivalent of one year’s worth of occupational noise into an ear, within one second! In cases like these, the affected ear is undoubtedly suffering massive damage. But after the acoustic attack, nothing happens, because the baby cannot complain about its impairment. Such damages remain undetected. Maybe 10 years later, the girl shown in Fig. 5, is consulting an ENT specialist who diagnoses massive damage of the left ear, but cannot understand what caused this injury. As mentioned earlier, the auditory system has to develop properly during childhood, free of injuries. 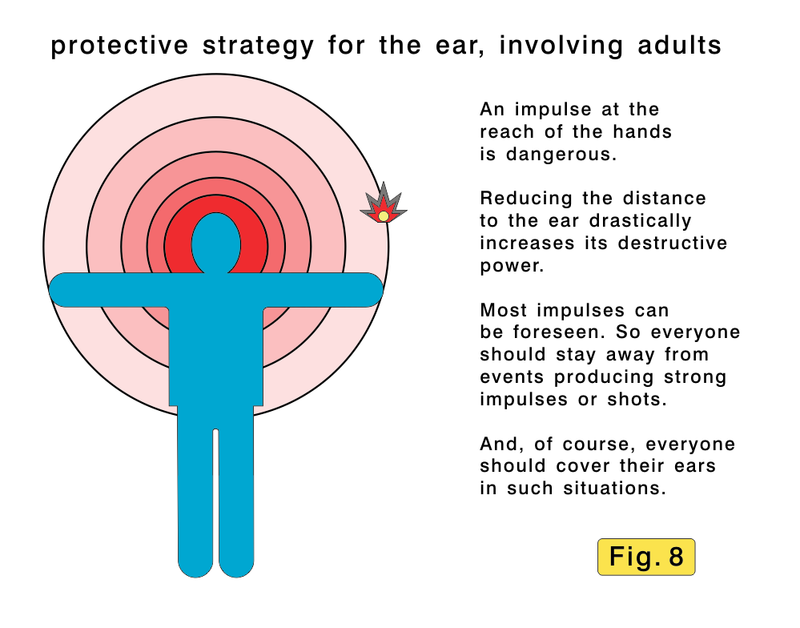 Because of this situation it is essential to give children’s ears more protection than adults’. It is time that this goal will be apparent in a standard for toys. Persons exposed to damaging impulses suffer from tinnitus, more or less seriously, and children are no exception. But children are often affected much more, because, along with their parents, they cannot handle the psychological after-effects. Here a dramatic and extreme example. At a festivity, two boys, ten years old, felt annoyed by a 7 year old boy. They grabbed him by the neck, and one of them shot him with a toy pistol into the left ear, and the other into the right ear. Auditory damage was not that severe, because, with the tip of the pistol’s barrel, they inadvertently closed the outer acoustic canal of the victim’s ears. However, the boy suffered from massive tinnitus, likely caused by hearing cells in the cochlea, crippled by the traumatic assault. He got medical treatment, including special therapies, but nevertheless he could no longer follow school, had nightmares and sleep deprivation, and gradually the life of the entire family disintegrated. After about two years the boy had to attend a school for disabled youngsters. And, it must be assumed, he will suffer from tinnitus for life. Another case was much less severe, but also informative. A girl, 13 years old, was working through a vocabulary book at school, when a male schoolmate approached and unexpectedly blew a whistle. According to eyewitnesses at a distance of 20 to 30 cm from the girl’s ear. Measurements with the whistle revealed a dominant resonance near 4 kHz. The action, considered teasing, resulted in some auditory damage, plus 8 months of continuous tinnitus. Keeping Fig. 1 in mind, it can be expected, if the boy had blown the whistle closer to the girl’s ear, she might have suffered tinnitus for life. In such cases tinnitus can be a bigger problem than auditory impairment, demonstrating the need for protective action. 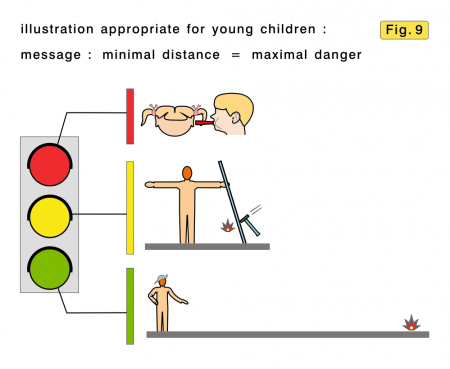 – Forms of permanent hearing loss in children are shown in Fig. 6. Another type of situation. Two boys, ten years old, are scheduled to celebrate their birthdays together, and so there will be noise. One of the fathers, realistic and circumspect, wants to get an idea what may be coming his way. Looking at EN71, at a library, he finds not only the illustrations shown here in Fig. 3, but more of the same, and text, widely scattered, of similar clarity. Even with good relations to persons active against occupational noise, there is no way to learn which toy is particularly harmful. The EU-standard is so awkward and unwieldy that it is preventing parents or teachers from learning immediately which specific toys are particularly harmful. There are many situations people would like to know if a certain toy may emit harmful noise: at a department store, at a fair for consumer goods, at schools, or at consumer offices. Such information must be available immediately, not many weeks and lots of expenditures later. Not only consumers need such information, but customs officials may also be interested. As a result of the globalized economy, most of the toys are manufactured in distant parts of the world, shipped to Europe, and then distributed and sold quite rapidly. If a child has been damaged by an excessively loud toy, an irate family may run the gauntlet and spend the expenses for testing the product according to EN71. However, by then the entire shipment has vanished into the depth of the EU, irretrievably. Apparently, there is a need for determining whether the noise of a toy is harmful or not, immediately, on the spot. Although this might seem far-fetched, it is not that difficult. 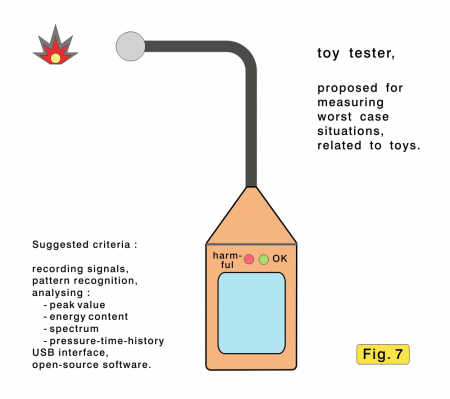 For such purposes a toy tester is proposed (Fig. 7). Immission has to be measured for worst case, at a distance of 2 to 3 cm from the source of the impulse. Such a hand-held device shall record the measured signal accurately, and unaltered [time-pressure-history]. The signal is then analyzed, to determine parameters that are informative, as peak pressure, energy content, spectrum, and others. Results are shown on the display. Basically there are two types of harmful impulses from toys. 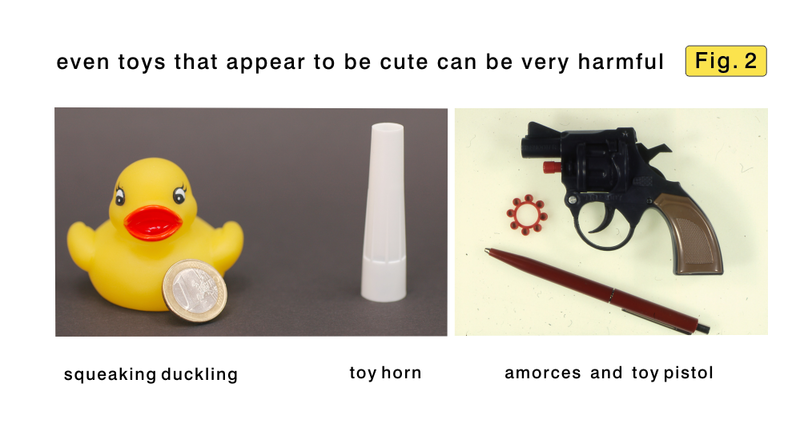 One is a sharp peak, short, as those from toy-pistols, and the other is a whistling or squeaking signal, as those from whistles, toy horns, or squeaking ducklings. Using pattern recognition the toy tester finds the relevant limit from the signal, and indicates whether it is harmless or dangerous. The technology for such a device is already available. The bent form of the microphone-holder is necessary to avoid reflexions from the tester, as well as from the hand that holds it. A toy tester for customs officials would permit spot checks of shipments. In case harmful signals are found, further processing of the shipment should wait, until official tests in the laboratory make clear that the toys are not considered illegal. – Such checks, or even their possible occurrence, is expected to reduce the number of illegally loud and harmful toys imported into the EU. – 90 dB(C) for whistling or squeaking signals. Protecting the sense of hearing needs more than the application of acoustics. Life has such a great diversity, with a myriad of complex situations, that it is impossible to take preventive measures purely on a technical basis. Instead, everyone should know how to avoid hearing impairment by noise. Fortunately, most harmful conditions can be foreseen, so that preventive measures are effective, such as covering the ears, or going away from the approaching harmful event. 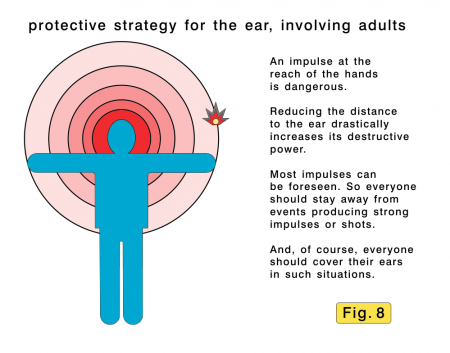 Powerful impulses close to the ear are the most harmful events. For children in their early teens. Verbal information plus Fig. 8, or something of that nature, is supposed to help. 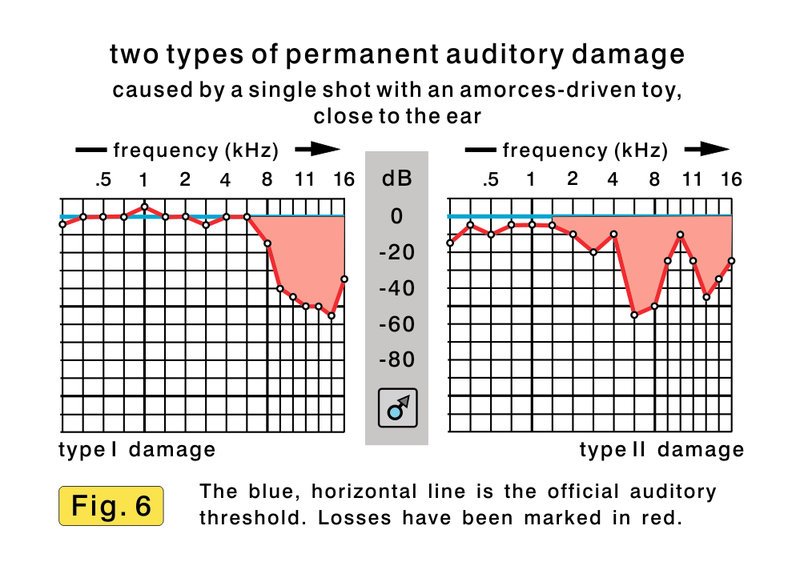 Damaging impulses do not only come from weapons, or some toys, but many are simply resulting from hammering, especially on metal, close to the ear. More or less small horns are used in many countries in relation to national or sports-events. If mouth-actuated the small ones are usually more dangerous, but the big ones are particularly harmful if they are driven by pressurized air or other technical methods. Everyone should stay away from those brutal sound sources. East Asia is famous for their firecrackers, which are used for celebrations of important events in life, for luring good luck. Men and boys are often proud to hold them with the hand on a string causing severe damage in many, because they are too close to their ears. – Teenagers love to go to discotheques, and some even stay right in front of loudspeakers. Of course, this is both, dumb and dangerous, because deafening noise should always be avoided. Mobile phones are other acoustic objects used close to the ear. While they are not particularly known to be harmful, in cases of alarm signals, the situation should be checked and analyzed. More serious is the situation for the so-called in-ear headphones. These small headphones are pushed into the outer end of the ear-canal, for listening with MP3 players and other devices. Because there is practically no energy lost, it is quite easy to overstimulate the ear, and therefore these devices mostly limit the acoustic output. For young children it is, of course, not appropriate to use the reach of hand for didactic purposes. But they have learned the danger associated with road traffic, and that traffic lights are very important for personal safety. Based on this background illustrations like Fig. 9 can be used for young children. Here, too, it is important to give the children verbal explanations on this topic, hoping the illustration will be an anchor for their memory. Children understand the danger and the recommended behavioral consequences: go away from the expected powerful sound, and cover your ears. – It is wise not to use in-ear headphones in young children, and they should not be exposed to loud music. These young ears must develop properly, learning to handle the multitude of events, along with their relations to other aspects of life. Protection of children against noise is lousy. The EU standard for toys is in some cases implicitly permitting exposure for children that are illegal at workplaces. It is ignoring types of toys that can be extremely harmful, and there are no restrictions as to dangerous frequencies. By measuring emission (outgoing sound) the EU standard is not suited for protective measures. For parents, teachers, and customs officials the development of a toy tester is proposed, using available technology. It shall immediately give information, easy to understand, if any toy might be harmful. Furthermore, society should give children’s hearing more protection than adults at the workplace. Axelsson, A., Jerson, T. (1985) “Noisy toys: a possible source of sensorineural hearing loss.” Pediatrics 76; 574-578. EU Directory 2003/10/EG Noise at the workplace, 7p. EU EN71-1 Safety of toys; Part1: Mechanical and physical properties. ; DIN EN71-1: 2007-08; 94p. Fleischer, G., Hoffmann, E., Lang, R., Müller, R. (1999) “Dokumentation der Auswirkungen von Kinderknallpistolen” HNO: 47; 535-540. Fleischer, G. (2007) “Noise-induced auditory damage in children” Yrkeshygienikeren, 2007; 2; 3-7. Trondheim, Norway. Gupta, D., Vishwakarma, S. K. (1989) “Toy weapons and firecrackers: a source of hearing loss.” Laryngoscope 99; (3); 330-334. Segal, S., Eviatar, E., Lapinsky, J., Shlamkovitch, N., Kessler, A. (2003) “Inner ear damage in children due to noise exposure from toy cap pistols and firecrackers: a retrospective review of 53 cases.” Noise & Health 5; (18); 13-18. Smoorenburg, G.F. (1993) “Risk of noise-induced hearing loss following exposure to Chinese firecrackers” Audiology 32; 333-343. 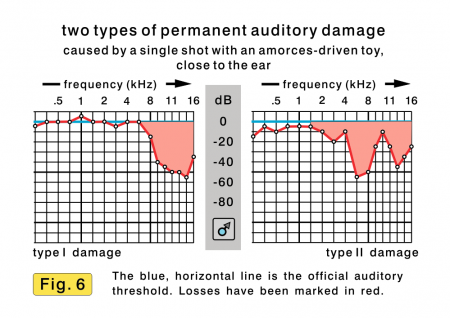 This entry was posted in Auditory Damage Prevention, Tinnitus Prevention and tagged auditory damage, horns, impulses, noise, tinnitus, toy pistols, toy tester, toys, whistles by gfleischer. Bookmark the permalink. I really like your figures; issues surrounding noise and sound are really difficult to illustrate graphically. Thanks for the comment. There will be more to come. A very informative site delivered in laymans language. As a cochlear implant user I have an interest in the plasticity of the auditory cortex in adults over 50 yrs of age. Can the brain re-educate itself to electronic auditory stimulation 5 years after 95% depravation? How long does it take a new born’s brain to build up sufficient stored data to understand the complexity of speech? There is so much to learn about the perception of hearing. Deafness disconnects you from people! Verbal communication is the cornerstone of society.